I visited Nashville a few months ago, and it’s no cliché to say that music oozes from that city’s proverbial pores. Nashville’s Caitlin Rose (originally from Dallas, TX), proved her natural talent at The Garrison – at 25 years old, Rose has a classic old country voice that some have compared to Loretta Lynn and Patsy Cline. In support of her recently released album, The Stand-In, the set began with album opener, “No One To Call.” Wearing a black and white polka dot dress and comfortable-looking cardigan, Rose was backed by a four-piece all-male band. The backing band included Andrew Combs, who was also the supporting act. While either playing guitar or tambourine on most songs, it was evident that Rose’s powerful vocals were front and centre. Though The Stand-In on record sounds produced and glossy, Rose and her band brought a lively warmness to the songs in a live setting, namely “Waitin’,” “Menagerie” and “Only A Clown.” A pedal steel in the band also helped to ensure the sound of country music authenticity. Sadly, “Old Numbers,” my personal favourite off The Stand-In, didn’t sound quite its jazzy/country self without the horns that appear on the album. 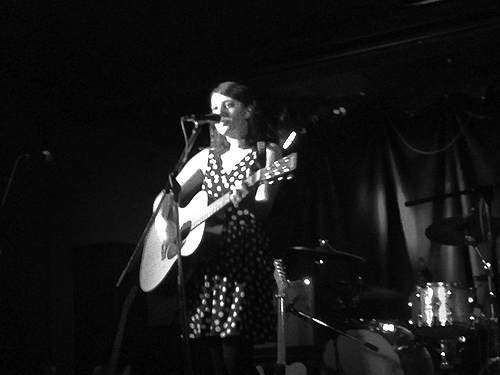 The audience at the Garrison seemed enthusiastic in their applause for Rose after each song, but unfortunately seemed strangely less generous in responses to Rose’s attempts at banter between songs. This seemed to irk Rose after repeated tries to interact with the audience while introducing her songs. I couldn’t help but wonder what a Nashville crowd would be like in comparison to this hot-and-cold Toronto audience. Still though, Rose and co. went on to play about an hour-long set that included a rousing Buck Owens cover, “I’ve Got A Tiger By The Tail” and lovely swooning torch song, “For the Rabbits” (which has, “absolutely nothing to do with rabbits,” Rose admitted when introducing the song) from Own Side Now. Closing the set with “Shanghai Cigarettes,” Rose seemed surprised to return to the stage after shouts of “One more song!” from the audience. Sans band and only using a tambourine to keep time, she sang “T-Shirt” about a well-loved t-shirt she gave to an old boyfriend and couldn’t get back after the breakup. Though shaky at first because she couldn’t quite remember the lyrics and exact rhythm, Rose eventually got it. Nashville bands seem to be disappointed by Toronto audience’s quietude; I remember Heavy Cream being similarly disappointed. when they opened for those darlins? i only caught the last song of their set and the crowd was definitely sparse at that point in the evening. i also wonder if the venue has something to do with it too.